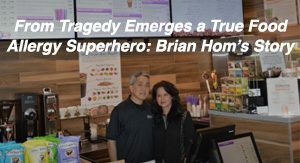 We recently released AllergyEats’ 6th annual Top 10 Most Allergy-Friendly Chains in America List and thought we’d take the food allergy community “behind the scenes.” If you’ve ever wondered how or why a specific restaurant chain made (or didn’t make) the Top 10, then this is the blog for you! 1. 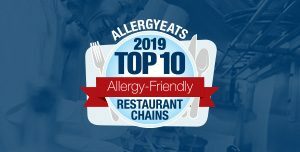 How does AllergyEats determine which chains make the Top 10 Most Allergy-Friendly Chains in America list each year? Actually, AllergyEats doesn’t determine which chains make this coveted list – our users do! This list is objectively created each year based on the ratings of individual restaurants around the country by our food-allergy community. At the end of the year, those chains that have earned the best overall ratings – accumulated from the ratings of all their individual restaurants – make our list. We include the Top 5 large chains, defined as those with over 50 restaurants, and the Top 5 small chains, those with fewer than 50 units. 2. Are there any newcomers to this year’s Top 10 list? Yes! We are always excited to see restaurant chains get rewarded for their efforts and make our list for the first time. This year, we enthusiastically welcome four new members. On the Large Chain list, Bertucci’s Italian Restaurant (4.43 overall rating) and Longhorn Steakhouse (4.28 overall rating) are our new additions. (Actually, both were previous members from when we actually had a Top 15 list – Bertucci’s in 2013 & 2014 and Longhorn in 2013.) On the Small Chain list, the new names are Weber Grill (4.52 overall rating) and 110 Grill (4.43 overall rating). Weber Grill is our smallest chain to ever make the list, at only 5 units. Weber Grill is based in the Chicago and mid-west area, while 110 Grill has their units in Massachusetts and New Hampshire. 3. Many food-allergic diners will be surprised to see that their personal favorite chain is NOT on this Top 10 list, while at the same time, others will say that they have had negative experiences at a chain that DID make the list. Can you offer any insights on what may be seen as an oversight, one way or another? Each year, we see many, many comments about chains that “should have” made the list as well as those that “don’t belong.” The simple answer, of course, is that AllergyEats ratings of individual restaurants, as well as chains, are determined by the entire community of food-allergic diners that use AllergyEats. Therefore, the determination of which chains belong on this list is based on the “wisdom of the crowd.” Certainly, there are other chains that do a great job day in and day out for most people; unfortunately, a Top 10 list can only include… well, 10! On the flip side, there is no chain in America – nor any restaurant, for that matter – that is perfect and will not disappoint customers from time to time, food allergies or not (which is why we don’t see chains with perfect 5.0 ratings). Thus, it should be no surprise that some people disagree with one or more of the chains being on this list. I might feel the same way if I had a negative experience at one of these chains. The bottom line is that experiences differ for different people at different times in different individual restaurants, and that the chains on this list have provided the most allergy-friendly service overall to customers in our community. The most valuable way to influence the chains that make this list – which happens to be a great way to help our entire 15-million-plus food allergy community – is to download the AllergyEats app (Google Play or App Store) or go to the website and rate all of your own dining out experiences! Each rating takes just a minute, but helps make AllergyEats a better resource for everyone. 4. How do a seafood chain and pizza/pasta-based chains earn a spot on the Top 10 list given the prevalence of fish, shellfish, wheat, and dairy allergies? This is another great question and criticism we get each year… fortunately with an easy answer. 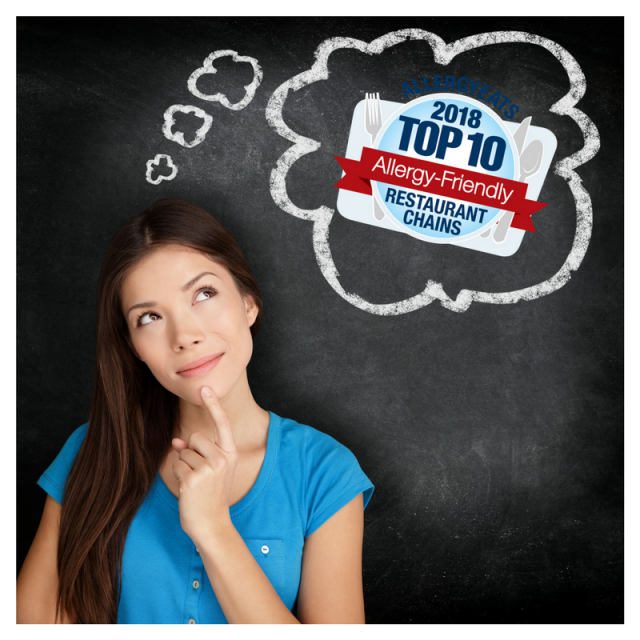 That easy answer is this: the most allergy-friendly restaurants and chains, regardless of their specialty, have ways of accommodating individuals with almost any allergy – even those with an allergy that would seem to conflict with their concept. If they have the proper procedures and protocols in place, particularly a strong education on preventing cross contact, they should have the ability to accommodate people with peanut, dairy, shellfish, wheat, or almost any other allergy. Take Legal Sea Foods as an example – a chain that has made our list for each of the 6 years we’ve published it. I personally recommended one of their restaurants to a friend with a fish-allergic daughter when they were visiting Boston. True, she thought I was crazy at first, but now that family has made Legals their go-to restaurant near their home! This is not to say that anyone should venture outside his or her personal comfort zone (which differs for everyone), but it does suggest that the way a restaurant is prepared to accommodate food-allergic guests is more important than the ingredients they have in the kitchen. As final proof, I will share that Legal Sea Foods, which has a 4.52 overall rating since AllergyEats’ inception, has earned a 4.90 rating from diners with fish allergies and a 4.44 from those with shellfish allergies! Similarly, Maggiano’s and Mellow Mushroom have earned, respectively, a 4.75 and 4.36 rating from dairy-allergic diners and a 4.53 and 4.30 from those with wheat allergies! It can be done! 5. 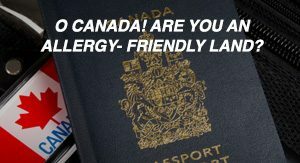 Do you find that the Top 10 recipients have anything in common that make them allergy-friendly? Absolutely. The most important factor is that each of these chains has a strong commitment to food allergy-friendliness from the top of the organization. I firmly believe that without a commitment from senior management, a chain or individual restaurant will not be allergy-friendly. There needs to be commitment to drive the investment – financial and non-financial (mostly the latter) – that creates this allergy-friendly culture. From there, every chain may have different training processes, operations procedures, and communications protocols in place, but the bottom line is that each does have a well-defined, well-orchestrated system. You shouldn’t see “deer-in-the-headlights” looks on the faces of these employees. Key parts of that system will involve communications from the customer to the staff to the kitchen and back (whether a manager is always brought to the table and/or whether food allergy dishes come out on a different shaped plate or other visible indicator), processes for preventing cross contact (which could include changing gloves, using a separate cooking station, frying in a pan instead of a shared fryer), training (whether in-house or with an outside service), a knowledge of ingredients or the ability to readily produce them, and the ability and willingness to modify dishes, often with easy “substitution” ingredients (such as Daiya cheese for those with dairy allergies). Again, don’t expect any chain on the Top 10 list (or elsewhere) to exactly mimic the procedures of any other chain, but DO expect that they can confidently answer questions related to any of the above. 6. If I go into one of these Top 10 chain restaurants, can I be assured a safe meal such that I don’t even need to bring an epinephrine auto-injector? Absolutely not!!! No chain, no restaurant, and no individual is flawless. People make mistakes and we, with life and death potentially on the line, need to be prepared for mistakes. While the chains on this list are the best of the best, even they can have a breakdown in the process. Note that none of these chains have perfect ratings and, as mentioned earlier, some will be criticized by our readers given their individual negative experiences. As I tell my kids, if you forget your epinephrine, you shouldn’t be eating. That applies anywhere. 7. How have the practices of Top honorees (and, in fact, the broader restaurant community) changed since the list began 6 years ago? 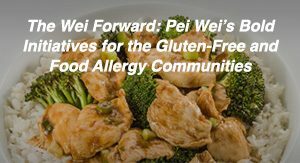 In general, with the passage of time and the acceptance that food allergies are real, widespread, and increasing, we’ve seen a general trend of restaurants becoming more allergy-friendly. Certainly that’s not true for all restaurants, and we see less progress made at high-end restaurants where creating a meal is akin to creating art, as well as some large restaurant chains that rely on franchising rather than owning all of their restaurants (less incentive for the parent company), but I should be careful before generalizing. At the end of the day, restaurants – and colleges, and sports venues, and vacation “destination locations” – are becoming more aware of the writing on the wall saying, “Ignore this large customer base at your own peril.” Our community is large and our sphere of influence is larger (we are the “veto vote” regarding where our party dines out or goes on vacation), so there is a lot of money to be lost for an organization that doesn’t make their foodservice business more allergy-friendly – not to mention that the risk of an accident, and associated liability, is higher. 8. Since these are chains with many individual restaurants, how can we rely on a chain-level rating to cover every individual restaurant in the chain? It comes down to what I said earlier about commitment from the top. 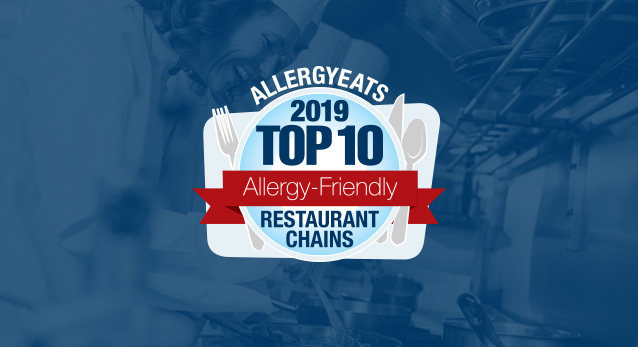 In general, chains with strong allergy-friendliness ratings have the commitment, and thus the procedures and protocols in place, such that their individual restaurants should be more allergy-friendly. The reverse is true too. That said, it is impossible to expect every unit in a 50-unit chain, let alone a 500-unit chain, to show consistent commitment. That’s why AllergyEats highlights the user ratings of each individual restaurant on its app and website, showing chain-level ratings less prominently. In actuality, I see much more variability of practice in non-allergy-friendly chains where some of their restaurants may be run by managers who deal with food allergies more personally and thus “get it,” even if the corporate level management doesn’t display strong commitment. 9. In general, which are more allergy-friendly – large chains or small chains? 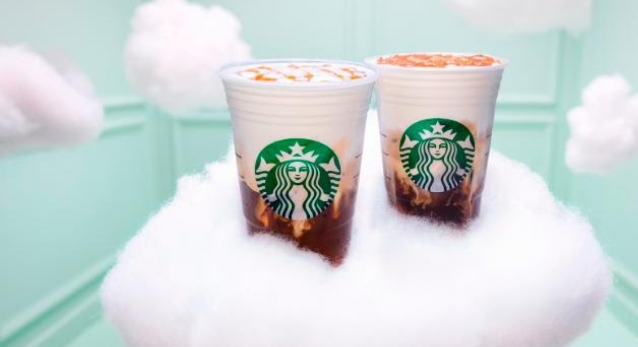 A glance at the Top 10 list would suggest to some that smaller chains are more allergy-friendly, though that could be deceptive given the much larger number of small chains from which to choose the top five. While I do in fact believe that the average small chain is more allergy-friendly than the average large chain, I would strongly remind everyone that large chains can absolutely be as good, if not better than, most small chains. Again, I refer you to the Top 10 list. Maggiano’s – a large chain – has a higher rating than every small chain in this country except 2. Chipotle, all except 4. Bertucci’s, the same. So while I find smaller chains that understand food allergies to be more aggressive in making allergy-friendly changes and more nimble in their ability to do so, thus giving them an inherent advantage, there is no reason a large chain can’t be just as allergy-friendly. Your best bet is to just check AllergyEats. 10. Some people insist that chains are more allergy-friendly than independent restaurants while others say the opposite. Which is true? Ahhh… the eternal debate in the food allergy dining community. Yes, some insist that chains have the financial strength to invest in equipment and strict chain-wide processes and procedures to ensure better accommodations for food allergy diners. Others are equally adamant that independent restaurants have greater flexibility in taking appropriate steps to more safely take care of their food-allergic guests. So what do I say? I say that both sides have hit on the positives, but at the end of the day the answer to the question of which are more allergy-friendly, chains or independents, is neither! Again, chains or independents, it all comes down to commitment. The fact that a chain like Burtons can hit a 4.83 chain-wide rating, and a larger chain like Maggiano’s can hit a 4.76, says a lot. At the same time, there are independents all around the US, led by restaurants like One Dish Cuisine in Ellicott City, MD, who can maintain ratings this high and higher. Similarly, there are many chains dragging along the bottom with ratings in the low 3’s and below, as well as many independents that just don’t know how to – or don’t care to – cater to our community. Some will outright state that they don’t want our business. So, in the end, there are many great chains and many great independents… and many poor chains and many poor independents. Please be sure to review your latest restaurant experiences – chains or independents – on AllergyEats today. Remember – we can’t do this without you. We’re all in this together! Read our blog about the latest Top 10 Most Allergy-Friendly Chains List here. Our trip’s main goal was that our children could have a safe inclusive dining out experience ,since we never dine outside our house back home , due to our severe allergies) and of course who doesn’t want to be at Disney ?!! I have 3 children ,2 of which have multiple food allergies – dairy, eggs, tree nuts- peanuts- sesame- rye and cherry . Reading reviews about Disney and it’s designated places for food allergies and going through what people say, we had very high expectations. I don’t know how and I don’t know why we didn’t get this satisfactory feeling I read people get at Disney ! 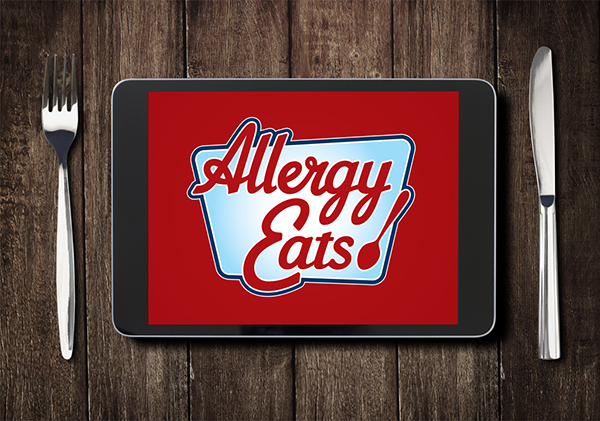 We loved AllergyEats app and it was so helpful and I would love to help in putting some feedback. Back to Disney ! Allergy cards or chef cards weren’t available anywhere we went for some reason ! Most prepackaged foods focus on tree nuts and peanuts and gluten free foods . Well ! Yes The best place and the only place that could be the reason for us as a family to move and live in the USA Orlando, is Disney springs ! I have to admit! We loved and were very relaxed at Erin McRenna’s bakery and T-Rex . Sometimes it’s not only the training that certifies to cater for food allergy needs , there has to be compassion and passion ( especially with when it comes to children – and especially when you are dealing with an allergy parent – who “seems” to be picky but in fact all they need to hear are nice words ! Taco Bell was a highlight ! Every time I asked my kids what they would eat they would say Taco Bell! Chipotle had the same friendly passionate spirit !